Zoë Hida, Business Development Manager and co-founder, seeks out new and inspiring opportunities for Appiwork and its customers. She loves meeting new people, delivering keynote speeches on innovation and entrepreneurship, and looking at how mobile solutions can connect people with ideas, information and each other. Before starting Appiwork with her husband Isao Hida, Zoë delivered powerful media and communication campaigns for private companies, government departments, charities and everything in between. She holds a Bachelor of Arts – Communication from Charles Sturt University where she won the Cox Inall Communication Scholarship for Rural and Regional Communication, a Certificate IV in Training and Assessment and is trained in facilitative leadership. Zoë is committed to supporting innovation in regional NSW and is a board member of the Bathurst Business Chamber and a founding member of the Bathurst Women’s Network. Can you tell us a little bit about your idea? What is Appiwork? Appiwork is a privately owned, Australian software company that specialises in native mobile application development and web services. 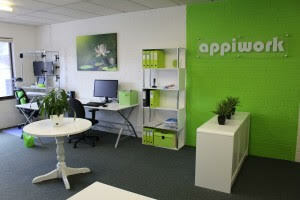 At Appiwork, we believe in creating simple, elegant solutions for complicated problems. We do this by developing mobile apps, websites and online systems that are custom-made to perfectly meet our customers’ needs. Our corporate customers tell us that our products deliver quantum leaps in efficiency. Our entrepreneur customers say we make their app dreams come true. Talk to us today to see if we can help you too. So what made you decide to take the plunge and make your idea happen? Isao and I moved back to my hometown Bathurst in Central West NSW with our baby during the GFC. Isao was working on the merger of IT systems for the new Department of Industry super department and I was working part time after maternity leave as a senior communication officer at Family and Community Services. Necessity forced us to create a new job for Isao when his contract ended. There is a glut of highly skilled IT professionals in Bathurst who have returned to raise their families here. When we couldn’t find a job worthy of Isao’s skills and passions, we realised we would have to create it, and so Appiwork was born. Isao, after many years in IT management, has returned to his first love of software development. I have retrained myself to learn all about mobile app development, digital marketing, online sales and user acquisition. Every day is fascinating as we meet people with amazing app ideas and look at how we can turn them into reality. We build apps, websites and online systems for app entrepreneurs, businesses and government departments who pay us a fee for service to develop and maintain their products. We own a financial stake in some of the new startups we are developing for app entrepreneurs. We also develop some of our own products that generate income from the App Stores and via subscriptions. We are working on a number of large, multi-national consumer app projects that could be the next big thing and hopefully bought out by the likes of Facebook or Microsoft. We’re also working on a number of products in the health and medical sector, which will make hospitals more efficient and treat patients faster. Being open-minded, trying new experiences and meeting new people trains your mind to be open to new opportunities. Luckily, we’ve got the resources at Appiwork to act on ideas! Mentors are essential to our development as business owners and app developers. We are always inspired by how generous people are in sharing advice and support. Working with developers and designers on creating our ideas. Meeting app entrepreneurs to explore what’s possible. The cost of local staff and lack of fast Internet are regular challenges. What other companies do you think are doing really cool stuff in your industry at the moment? Making information and resources more accessible. Entertaining and inspiring people to think about new possibilities for their lives. Speaking of affecting social change, is there a particular charity that you support? Women affected by Domestic Violence. We would look at working with some marketing contractors and interns on a commission basis/download basis.